In February 2017, a group of organizations, advocates, local artists, faith leaders, and Baltimore residents gathered to lay the foundation for what would become the “Baltimore Table” of the Peoples Climate Movement. We decided at our first meeting that the 2017 Peoples Climate March would be a catalyst for bringing together formerly disconnected organizations, issues, and campaigns into an intersectional climate justice movement for Baltimore — not to launch any new campaigns per se, but to ignite and infuse energy into ongoing work that aligns with the Peoples Climate Movement platform. Our coalition quickly grew to include over 25 organizations including representatives from communities centered on: faith, labor, criminal justice, workers rights, fair development, environmental protection, public health, students, transit equity, economic justice, and more. We grew our table and deepened our bonds over the 3 months leading up to the march with an emphasis on “relationship over task.” Yes we worked tirelessly together to mobilize over 600 Baltimoreans to the People’s Climate March in Washington, DC on April 29, 2017 — no small feat. Yet, the journey to make that possible was perhaps more important for our movement than that one day of mobilization because we built a community. We demonstrated how we can depend on one another, and we had fun with it! As a result of that journey, we’re still here after the march — bound to one another for climate justice in Baltimore. In June 2017, less than two months later, we worked together with our community’s young people at the vanguard to secure a unanimous commitment from Baltimore City Council to an ambitious, comprehensive and necessary climate justice agenda for the city. Now, as we work to make sure our local leaders deliver on their promise for climate justice, we continue to show up for one another in solidarity as we collectively struggle for justice on every front. Note: these principles are built on the Jemez Principles for Democratic Organizing, adopted by participants in the Southwest Network for Environmental and Economic Justice at their Working Group Meeting on Globalization and Trade in 1996. Below is each of the 6 Jemez Principles, and thoughts about how our structures can reflect them. Please add your thoughts! Be Inclusive. If we hope to achieve just societies that include all people in decision-making and assure that all people have an equitable share of the wealth and the work of this world, then we must work to build that kind of inclusiveness into our own movement in order to develop alternative policies and institutions to the treaties policies under neo-liberalism. This requires more than tokenism, it cannot be achieved without diversity at the planning table, in staffing, and in coordination. It may delay achievement of other important goals, it will require discussion, hard work, patience, and advance planning. It may involve conflict, but through this conflict, we can learn better ways of working together. It’s about building alternative institutions, movement building, and not compromising out in order to be accepted into the anti-globalization club. We intentionally build the Table as a space for movement-building, outside of the “environmental sector,” and structure our operations in a way that will be inviting and accessible to lots of organizations and individuals. This includes scheduling meetings in the evenings, in transit-accessible locations that are welcoming to all individuals and communities, especially those underrepresented in the environmental movement. We democratically decide the agendas and meeting structures for our PCM Table meetings and associated cluster meetings about internal operations, outreach, events, policy, and other focus groups. We share meeting time polls, meeting times, and agendas well in advance of meetings, so that Table members can discuss the issue with their teams and prioritize being present for issues that impact them. We do not make decisions about issues without impacted organizations and individuals in the room. Emphasize Bottom-Up Organizing. To succeed, it is important to reach out into new constituencies, and to reach within all levels of leadership and membership bases of the organizations that are already involved in our networks. We must be continually building and strengthening a base which provides our credibility, our strategies, mobilizations, leadership development, and the energy for the work we must do daily. We continue to grow and deepen our partnerships as a community dedicated to prioritizing relationship over task. This means sometimes taking a step back to have fun together! We prioritize grassroots voices and outreach in our processes and decision-making. We will continue transparent outreach to potential partner organizations who do advocacy work in Baltimore, and hold ourselves and each other accountable for scheduling one-on-one meetings and inviting more people into the BPCM. Let People Speak for Themselves. We must be sure that relevant voices of people directly affected are heard. Ways must be provided for spokespersons to represent and be responsible to the affected constituencies. It is important for organizations to clarify their roles, and who they represent, and to assure accountability within our structures. We use our public platforms to intentionally share credit, media attention, etc in ways that direct attention to grassroots organizations, Baltimore-based organizations, impacted individuals, and others on the front lines. We highlight partnerships to communicate the broad base and intersectionality of our coalition. For example, when a Table member holds a press event, non-traditional or unexpected Table partners shows up and publicly supports the effort to demonstrate the intersectionality of the coalition. Intentionally inviting the groups and individuals that need to be present for each conversation. Table members take responsibility for their own education to learn more about partner organizations’ focus areas. Practice authentic, creative brainstorming and intentionally avoid groupthink. Commit to sharing honest feedback and enthusiastically engage in uncomfortable conversations. Practice active listening and embrace “both/and” thinking as opposed to “either/or” thinking. Work Together in Solidarity and Mutuality. Groups working on similar issues with compatible visions should consciously act in solidarity, mutuality and support each other’s work. In the long run, a more significant step is to incorporate the goals and values of other groups with your own work, in order to build strong relationships. For instance, in the long run, it is more important that labor unions and community economic development projects include the issue of environmental sustainability in their own strategies, rather than just lending support to the environmental organizations. So communications, strategies and resource sharing is critical, to help us see our connections and build on these. We intentionally reach out to and take leadership from grassroots groups working on other issues of justice and equity in Baltimore City. We each take responsibility to work within our own organizations to maintain awareness of issues outside of our organizations’ focus areas and raise possibilities for work in solidarity with those issues. We will prioritize the issues over ego. We will be cognizant of the pressures of the nonprofit industrial complex and do our best to avoid common pitfalls. Build Just Relationships Among Ourselves. We need to treat each other with justice and respect, both on an individual and an organizational level, in this country and across borders. Defining and developing “just relationships” will be a process that won’t happen overnight. It must include clarity about decision-making, sharing strategies, and resource distribution. There are clearly many skills necessary to succeed, and we need to determine the ways for those with different skills to coordinate and be accountable to one another. We strive to build transformational, not transactional, relationships among ourselves. Organizations and individuals become members of BPCM by signing on to this Principles and Platform document and participating in the work of BPCM according to their capacity. We will intentionally on-board new organizations and individuals to BPCM in order to provide them with an introduction and context to our work and partnerships. We use our Purpose statement and Platform as the arbiter for disagreements that arise among Table members. If groups disagree, they will choose a mutually-agreed-upon third party to mediate. Commit to Self-Transformation. As we change societies, we must change from operating on the mode of individualism to community-centeredness. We must “walk our talk.” We must be the values that we say we’re struggling for and we must be justice, be peace, be community. We commit to a style of working together that is bottom-up instead of top-down and to intentionally stepping back and supporting ongoing work. We embrace processes that facilitate communal instead of hierarchical decision-making. This is a working document that will evolve along with our collaborations. It is a collective document that invites your input. Climate change affects Baltimore’s air, water, and land, worsening existing environmental, economic, and social injustices that affect the health of all our residents but are most drastically felt by communities of color. Because of the history of redlining, white flight, deindustrialization, and systemic disinvestment, these environmental injustices affect Black communities disproportionately and exacerbate the multitude of injustices that Baltimore’s Black communities face. Climate change exacerbates existing inequities in Baltimore, including energy systems, health, and infrastructure. Climate change and the reliance on fossil fuels that are warming the planet make it harder for Baltimoreans to afford energy. Subsidies for dirty energy mask the true costs of fossil fuels to ratepayers and allow big energy companies to externalize risk on frontline communities. At the same time, energy unaffordability forces tens of thousands of Baltimoreans to make impossible choices between paying for food, medicines, rent, or energy bills. A fossil-fuel-driven food system contributes to the phenomenon of food deserts across Baltimore, placing foods that are healthful, local, or low-emission out of reach for many Baltimoreans. Climate change increases key drivers of inequitable health outcomes in Baltimore. The energy sources that cause climate change also create the local air pollution that sickens Baltimoreans with air-pollution-related ailments and makes asthma the leading cause of school absenteeism among Baltimore’s students. Temperature increases may further stress the health of vulnerable peoples through factors including extended allergy seasons, surges in heat stress, heart disease, asthma and other lung diseases, and the spread of vector borne illnesses like Lyme disease and the Zika virus. Sea level rise and warmer temperatures increase the frequency and severity of storms in our region, increasing polluted stormwater runoff, exacerbating floods, degrading local water quality, and stressing our underground infrastructure. Increased moisture and flooding creates indoor mold, contributing to vacancy, bad indoor air quality, and adverse health outcomes. More rain will allow raw sewage to escape our sewage and stormwater pipes into our streets, streams, and basements during storms, damaging local waterways and harming people’s health and homes. These impacts are ongoing, interconnected, unequally distributed, and will worsen in the future. Limiting warming to 1.5 degrees Celsius (roughly 3 degrees Fahrenheit) will not resolve these problems, but would prevent the worst possible impacts of the climate crisis. Emissions reductions must benefit the most impacted communities. Overall emissions reductions that continue to sacrifice frontline communities are not acceptable. Reduce greenhouse gases and pollution from Baltimore-area sources to counteract climate change and improve public health in the most impacted communities. Transition to an equitable, sustainable, and democratic New Energy & Economic Future in which clean energy is accessible to everyone, generated and used locally, and managed democratically by the community. Reinvestment in a local industrial base that drives toward an equitable and sustainable New Energy & Economic Future. Demand that every job pays a livable minimum hourly wage of at least $15 (based on 2015 USD rates) directly from their employer, without tip credits or other deductions, that is then indexed to local inflation and cost of living rates. Jobs must protect workers, provide a high standard of living, eliminate working poverty, and provide a right to organize independently. 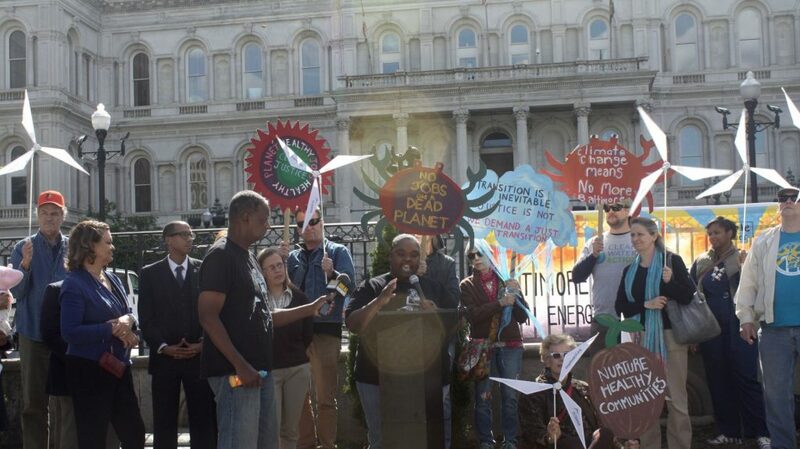 Ensure that in the New Energy & Economic Future investments are targeted to create pathways to good jobs and economic power for Baltimore’s disenfranchised, including but not limited to: Black people, Latinx people, Indigenous peoples, low-income people, returning citizens, women, laborers, people with disabilities, and people who identify as LGBTQIA. Create thousands of jobs in the public and private sector by making bold investments in Zero Waste systems that eliminate incineration and reduce, reuse, recycle, and compost valuable discarded materials to avoid landfilling. Protect the human right to safe, healthy, affordable housing; establish community-controlled development processes like land trusts; eliminate the use of tax lien sale for outstanding taxes and fees; and retrofit existing and construct new homes and businesses to be energy efficient. Invest in Baltimore’s infrastructure to ensure that every Baltimorean has clean, safe, affordable drinking water and natural waterways; sewer systems that eliminate contaminated overflows into streams and homes; stormwater systems that reduce local flooding and erosion by capturing stormwater at its source through rain gardens, green roofs, rainwater cisterns, and other best management practices; and green spaces. Transition to a modern, efficient electric grid that maximizes diverse renewable energy resources to lower costs and increase reliability and resiliency. Design and build streets that are optimal for all road users regardless of age, ability, income, race, ethnicity, or chosen mode of travel, and result in traffic calming, pedestrian improvements, bike lanes and paths, bus lanes and improved bus infrastructure, improved connections between modes, and consideration of local land use. Transit systems, including Baltimore’s bus system, light rail, and the revived Red Line, must provide sufficient transportation to the 33% of Baltimoreans without access to a car, and incentivize Baltimoreans with car access to choose public transportation. Implement a public oversight board of criminal justice reform to monitor, advise, recommend and implement policies designed to support former offenders and returning citizens in securing gainful employment particularly in public and private clean energy jobs; bail reform; prisoner/inmate rehabilitation, safety and environmental justice and police brutality and corruption. Ensure that all Baltimoreans have access to fully funded community schools that improve educational outcomes for youth and ensure that families and school communities are healthy and successful by building a pipeline of integrated and comprehensive services which support the ability of youth to succeed, thrive, aspire to college and/or career while deliberately excluding interactions with the criminal justice system. We serve to draw connections between seemingly disparate issues in Baltimore and climate justice in the spirit of equity solidarity. Policies and actions taken to address climate change in Baltimore must also address other justice issues. By making these planks a reality in Baltimore, we will build the New Energy & Economic Future. We commit ourselves to working together to embody the above-stated principles. If you share these principles, we invite you to join us in fulfilling them. The Baltimore Transit Equity Coalition defines equity solidarity as “the concrete collaboration among groups and individuals actively seeking to establish just, healthful, and democratic policies, programs, and conditions in pursuit of an equitable society.